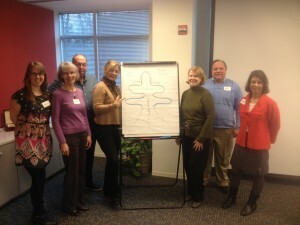 Creativity, meditation, and personal improvement intersected on Friday, February 21st for the QRCA DC Metro Chapter meeting held at Observation Baltimore. George Pierson, a former creative executive at HBO and Discovery, gave his presentation on the “The Creative Power of Brainwave Alignment Training.” The aim of this presentation was to show the attendees how to inspire spontaneous creative insights through a technique called the Awakened Mind. He emphasized the ability to balance both the right and left side of your brain in order to maximize your creative capacity. It was a pleasure learning from George, and we look forward to having him back on Friday, May 2nd for his follow-up presentation. This entry was posted on Thursday, February 27th, 2014 at 7:02 pm. Both comments and pings are currently closed.